This issue begins with a dossier titled “Toward Planetary Decolonial Feminisms,” which features essays centering feminist queer of color critical thought in social activism and political philosophy. Other essays in this issue explore racial fetishism; the philosophy of culture in the context of Africana and black thought; a rereading of Freud’s work on unconscious affects; Glissant’s poetics and thinking in the wake of trauma; and a reflection of the impact of AIDS on the queer movement’s future. Contributors include Paola Bacchetta, Ueno Chizuko, Silvia Rivera Cusicanqui, John E. Drabinski, Didier Eribon, Elizabeth Freeman, Lewis R. Gordon, Cho Haejoang, Adrian Johnston, David Marriott, and Laura E. Pérez. 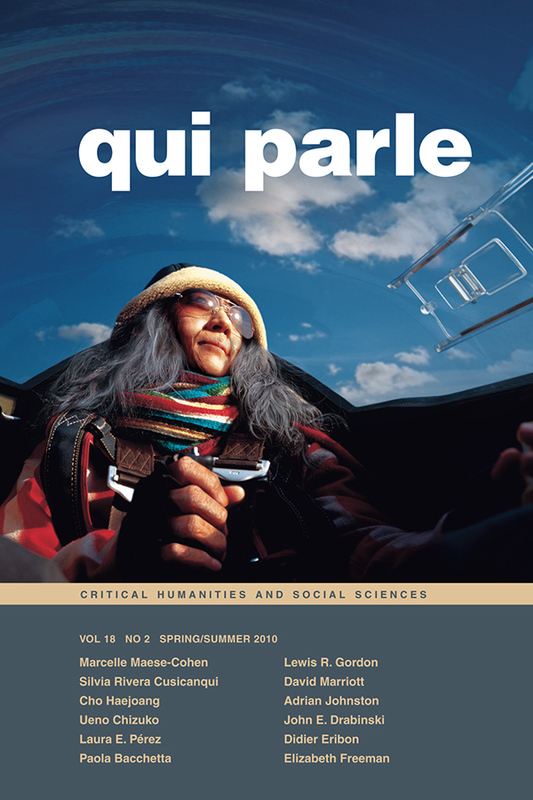 View the table of contents for Qui Parle 18:2, at the journal's online site.